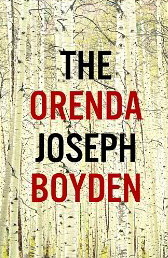 Well, what does one say about Joseph Boyden’s The Orenda? I read the book recently, after it won this year’s Canada Reads competition in which five books and their defenders faced off to eliminate and leave standing “one novel that could change Canada.” Reviews of The Orenda have been laudatory; apparently there was a “gasp” when it didn’t make the Giller Prize shortlist. It has received sharp criticism as well, especially from aborginal reviewers like Hayden King. It bothers me when I’m not sure I can trust the history of historical fiction. I can’t quite forgive Tanis Rideout, for example, for fiddling with some (to me) significant facts in her beautifully written Above All Things, about George Mallory’s attempt at Everest. So I’m not sure what to think about the controversy over the history here, except that it seems more about interpretation than time line and facts. I’ve realized I’ll have to leave that tug-of-war to scholars of the (pre) Canadian period and focus on the story instead. Stylistically, I found the novel somewhat slow-moving because nearly everything that happens passes through three voices whose tone is curiously similar, though this may have been intentional. I felt the characters didn’t quite inhabit themselves as much as their respective worldviews, customs, and gestures. I definitely enjoyed Boyden’s 2008 novel of contemporary aboriginal life, Through Black Spruce, more. This entry was posted in Books, History and tagged aboriginal-European encounter, Above All Things, Canada Reads, Dora Dueck, Hayden King, Joseph Boyden, review of the orenda, The Orenda, Through Black Spruce by doradueck. Bookmark the permalink. Hayden King’s review speaks of the universality of violence among humans and laments the fact that Boyden in the Orendas singles out the Indians for their brutality and savagery thus promoting old stereotypes of the Indians as savages. Was that your impression as well? I haven’t read the book. If perhaps I had any impression of earlier First Nations peoples, at least as portrayed in more recent years, it was one of living peacefully with the land. So I have to say that the torture portrayed in the book — a particular custom in which a number of enemies are “caressed” with torture over several days, and in which they also show their nobility by enduring it — took me aback a little. Because it’s so “personal” as Boyden puts it, it makes a big impression and is hard to read. And in this particular story, it happens to be the warring Huron and Haudenosaunee who do the violence, and the latter, as King says, who seem the constant threat. So if that’s a stereotype, I guess it underlines it. The Europeans–in this story–do their damage by the diseases they bring in, and the alcohol and weapons they provide. And their huge misunderstanding of the native ways. But somehow you feel that this is a meeting of two worlds in which no one comes off completely well or completely badly. The Jesuit priest always refers to the people as “sauvages” (using the French spelling) and so we hear that over and over, but I think the readers know that this is his Eurocentric view and that it was totally unfair. As were some of the Huron impressions of him. — I was struck by a scene very early on (so not a spoiler) in which Snow Falls, the girl who is captured and has just seen her family killed, catches sight of the priest’s crucifix and she thinks it’s an image of her dead father. So the priests carry about constantly this image of “torture” too, and eat his “flesh” and so on! Those are great opening and closing sentences, Dora, and your review seems generous to me. My writing group member Ervin Stutzman is taking up the challenge of writing through an aboriginal voice in the next volume of his trilogy that begins with the newly-published Jacob’s Choice. Are you familiar with the story? Ervin is working with Native Americans and historians and really wants to make his story “true” to both historical facts and emotional realities. Hard work! I’ve heard of this story, yes, but not read it yet. — You’re so right, Shirley, historical fiction (though this tells a “true” story, right?) has its unique challenges, especially when it involves taking on the voice of another culture. Outsiders can so easily be accused of misappropriation so I’m glad to hear of his working relationship. Thanks for the link! –Joseph Boyden has some First Nations ancestry and is well poised, I think to bridge the cultures. I appreciated reading your perspective on this novel, Dora. I just finished it last week and found reaction similar to yours in many ways. In particular, I resonate with this sentence: “It bothers me when I’m not sure I can trust the history of historical fiction.” I suppose there is no such thing as a neutral portrayal of any historical event, but this one seems particularly prone to being heavily politicized given our current cultural moment. Off-topic, but I can find no other way to email you, Ms. Dueck! I am trying to find out if your aunt Margaret Harder was the translator of Nicholas Fehderau’s A Mennonite estate family in southern Ukraine. I am cataloging the book for the Mennonite Historical Library and need to distinguish its translator from all the other Margaret Harders. Thanks in advance. Yes, she was. If you need more information, you can contact me at the email address indicated at the end of my “About” page.